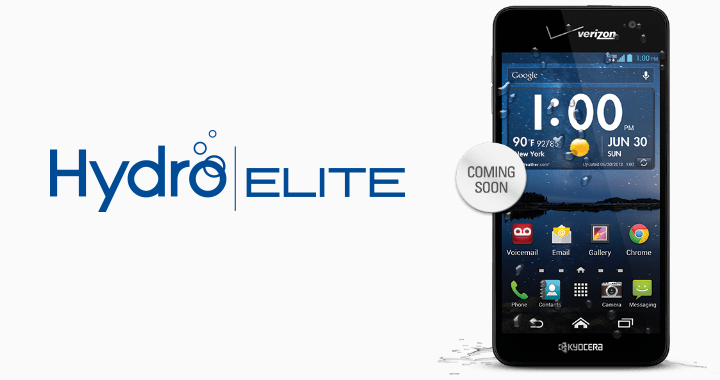 According to the leaked Verizon roadmap, Kyocera Hydro Elite was scheduled to be released by the end of August. It is a water resistant smartphone and was launhed on 29th August. The price is kept to be $99.99 with a two-year contract and a $50 mail-in rebate. Though it is not that powerful but yes, it is rugged. It features IPX5 and IPX7 certification for both low-pressure water spray and water immersion. The Kyocera Hydro Elite includes a dual-core 1.5GHz processor along with 1.5GB RAM. It also features a 4.3-inch 720p display, 16GB storage, microSD, global roaming support, NFC, an 8MP rear cam, 1.3MP front cam, 4G LTE, wireless charging support and a 2,100 mAh battery. To improve the battery life, this smartphone includes Eco Mode with MaxiMZR power-management software. Kyocera Hydro Elite is not only dustproof but is also able to withstand water for up to 30 minutes at a max depth of 3.28-feet. This superb combination of mid-range specs and ruggedized hardware help the device to stand out a little, it really sets the phone apart from similar devices is the use of Kyocera’s proprietary Smart Sonic technology. The phone actually uses a “ceramic actuator to deliver sound directly into your eardrum. It results in superior audio quality even in noisy environment.